Stainless Steel needle and nozzle sets. 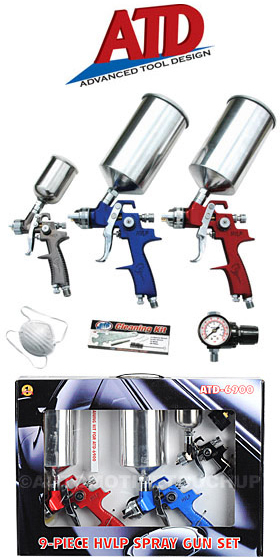 This 9 piece spray gun set is a good entry level set. Some consider these guns "throw away" which means that you can use it until it breaks, and then throw it away rather than sending it off to get rebuilt. The set is great for an amateur that doesn't want to invest big money into expensive spray equipment, but wants a variety of guns to work with.